Model of the brain-machine interface for real-time synthetic speech production. The stroke-induced lesion (red X) disables speech output, but speech motor planning in the cerebral cortex remains intact. Signals collected from an electrode in the speech motor cortex are amplified and sent wirelessly across the scalp as FM radio signals. The Neuralynx System amplifies, converts, and sorts the signals. 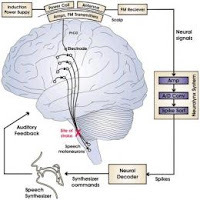 The neural decoder then translates the signals into speech commands for the speech synthesizer. Credit: Guenther, et al. By implanting an electrode into the brain of a person with locked-in syndrome, scientists have demonstrated how to wirelessly transmit neural signals to a speech synthesizer. The "thought-to-speech" process takes about 50 milliseconds - the same amount of time for a non-paralyzed, neurologically intact person to speak their thoughts. The study marks the first successful demonstration of a permanently installed, wireless implant for real-time control of an external device. The study is led by Frank Guenther of the Department of Cognitive and Neural Systems and the Sargent College of Health and Rehabilitation Sciences at Boston University, as well as the Division of Health Science and Technology at Harvard University-Massachusetts Institute of Technology. The research team includes collaborators from Neural Signals, Inc., in Duluth, Georgia; StatsANC LLC in Buenos Aires, Argentina; the Georgia Tech Research Institute in Marietta, Georgia; the Gwinnett Medical Center in Lawrenceville, Georgia; and Emory University Hospital in Atlanta, Georgia. The team published their results in a recent issue of PLoS ONE.